The Resource-based View (RBV) of the Firm is an approach to business strategic management that emerged in 1980s and 1990s. Major proponents were Wernerfelt, B. (“The Resource-Based View of the Firm”), Prahalad and Hamel (“The Core Competence of The Corporation”) and Barney, J. (“Firm Resources and Sustained Competitive Advantage”). But its origins can be traced as far back as Edith Penrose and “The Theory of the Growth of the Firm” (1959). The approach is based on the concept that firms consist of various types of tangible and intangible resources – assets, processes, skills, information, knowledge, etc. When these resources are combined, they create ‘Business Capabilities’ (viewed as a special type of resource), some of which, either individually, or in combination, create a set of “Core Competencies”, that provide a sustainable competitive advantage to the firm. Not all resources are equal. It is those resources that are valuable and rare that create a competitive advantage that is sustainable, i.e. are difficult for competitors to imitate. What this leads to are companies that do not think of themselves in terms of the products that they make, or the services that they provide, but rather as a set of core competences that create global leadership in the sectors they choose to operate within. On the surface these companies can have product portfolios that seem idiosyncratic. A good example is Honda, who’s core competence in engines and power trains has given it a long standing competitive advantage in car, motorcycle, lawn mower and generator businesses. This is also reflected in their long standing commitment to formula One – a good example of how core competences can be re-enforced further, by how the company is perceived. In the service sector, more recent examples include Amazon and Google, who have created highly diverse businesses, but based on some clearly well thought through core competences. Sourcing Decisions. To paraphrase Prehalad and Hamel, “it is not possible for a company to have an intelligent alliance or sourcing strategy, if it has not first made a choice about its core competences”. A good example of this is Ocado in the UK. Extensibly an online Supermarket, they view themselves foremost as a technology company. Enterprise Architecture. The link to Enterprise Architecture was originally made by Prahalad and Hamel in “The Core Competence of the Corporation” and in their well known book “Competing for the Future”. They argued that companies should develop a corporate-wide strategic architecture, that identifies which core competences to build; and their constituent technologies and other resources. 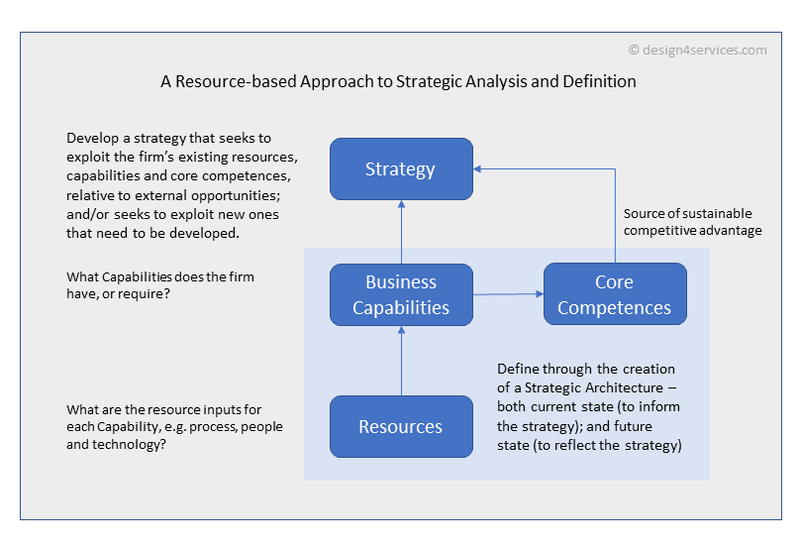 Today, this approach can be seen through the use of Business Capability Modelling (BCM), which provides the principal link between strategy and operational design. I’ve provided links to several of the key RBV papers at the start of the article. I would particularly recommend “The Core Competence of the Corporation” by C.K. Prahalad and Gary Hamel; and also their book “Competing for the Future”. If you want to delve more deeply into what has today been more broadly defined as the “capability view of the firm”, which includes RBV, but also other theories such as “Dynamic Capabilities” theory, then I would suggest the following relatively recent paper by D J Teece, “A capability theory of the firm: an economics and (Strategic) management perspective”, 2017.